BRUSSELS, Belgium, 2017-Mar-13 — /Travel PR News/ — The Rezidor Hotel Group, one of the most dynamic hotel companies in the world and a member of the Carlson Rezidor Hotel Group, has been recognized by the Ethisphere Institute, a global leader in defining and advancing the standards of ethical business practices, as a 2017 World’s Most Ethical Company®. Rezidor has been recognized since 2010 and is one of only three in the lodging and hospitality industry, underscoring the company’s commitment to leading ethical business standards and practices. This is the 11th year that Ethisphere has honored companies that recognize their role in society to influence and drive positive change; consider the impact of their actions on their employees, investors, customers and other key stakeholders; and use their values and culture as an underpinning to the decisions they make every day. The World’s Most Ethical Company assessment is based upon the Ethisphere Institute’s Ethics Quotient® (EQ) framework, which offers a quantitative way to assess a company’s performance in an objective, consistent and standardized way. The information collected provides a comprehensive sampling of definitive criteria of core competencies, rather than all aspects of corporate governance, risk, sustainability, compliance and ethics. Best practices and insights from the 2017 honorees will be released in a series of infographics and research throughout the year. Organizations interested in how they compare to the World’s Most Ethical Companies are invited to participate in the Ethics Quotient. Rezidor operates the core brands Radisson Blu® and Park Inn® by Radisson in Europe, the Middle East and Africa (EMEA). In early 2014 and together with Carlson, Rezidor launched the new brands Radisson RED (lifestyle select) and Quorvus Collection (luxury). In 2016, Rezidor acquired 49% of prizeotel. 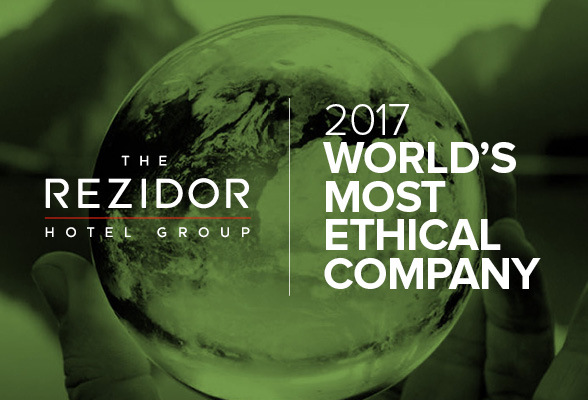 Rezidor has an industry-leading Responsible Business Program and was named one the World’s Most Ethical Companies by the US think-tank Ethisphere. Rezidor’s ambitious and award-winning Responsible Business program dates back to 1989. The program’s three core areas ensure that we care for our guests, our people and our planet and act in an ethical way: Think Planet: minimizing our environmental footprint; Think People: Caring about guests and employees, people in our supply chain and business ethics; and Think Community: Contributing in a meaningful way to local communities around the world. Rezidor has received numerous awards and accolades for being an innovative leader in sustainability practices, responsible business, and its safety and security program. More than 79% of our hotels across EMEA are already eco-labelled, and we are committed to rising to 100%. Since 2010, the group has maintained its recognition as one of the Most Ethical Companies Worldwide (by Ethisphere Institute). In 2014, the group’s CEO also announced the company’s focus on developing more women in leadership positions, as part of its employee value proposition (Our Promise). This is the group’s proactive mission to bring about a truly positive change in the company’s Diversity and Inclusion culture, aiming to have 30% of its senior leadership positions taken up by women. Rezidor has been subscribed the UN Global Compact since 2009 and is a signatory to the UN CEO Water Mandate. For more on Rezidor’s Responsible Business, visit www.responsiblebusiness.rezidor.com. This entry was posted in Hospitality, Hotels, Travel, Travel Awards, Travel Management, Travel Services and tagged 2017 World’s Most Ethical Company®, Carlson Rezidor Hotel Group, Ethisphere Institute, The Rezidor Hotel Group, Wolfgang M. Neumann. Bookmark the permalink.